Commonly called short sightedness, this is the most common refractive error. This problem usually results when the length of the eye is too long for the power of the lens. 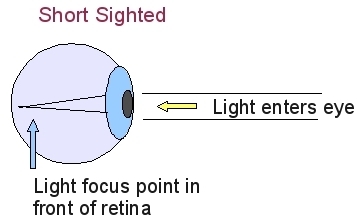 As can be seen by the illustration in the image below, the lens is bending the light in too much so that the point of intersection is in front of the retina. As noted above myopia is generally associated with a longer than normal distance between the lens and the retina. A normal distance is about 20mm. There are two schools of thought on the causes of myopia. One group believes that initially myopia is caused by too much close focus work. They assert that the subsequent elongation of the eyeball, in addition to being caused by the close up work, is often made worse, by the wearing of glasses. One argument against this opinion is that there appears to be some genetic factors at play. For example, identical twins with quite different environments and study habits will show the same or similar vision issues. However, this is not to say that too much close up eye strain does not contribute. There is some pretty strong evidence that it does. The other group are of the opinion that the elongation of the eyeball is not linked to close up work, or the use of prescription items, but hold more to the genetic argument People and practitioners who hold this position would generally not hesitate to use and recommend glasses, contacts and similar methods. Perhaps the truth lies somewhere between these two positions. As with most refractive errors, the most popular solutions are glasses and lenses. If the cause of short sightedness is a genetic disposition, and an environment of too much close work, then there is a powerful argument for natural eye exercises and Vision Therapy. If close up work can cause or contribute to it, then correct exercises can play a part in reducing or eliminating it. First they must encourage the lens to flatten out. This involves the ciliary muscles relaxing sufficiently to allow the tension from the suspensory ligaments to pull more effectively. Secondly, the accommodation and convergence coordination of both eyes must be improved. Any eye exercise program that does this will be of benefit.